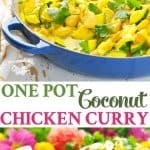 A vibrant, flavorful dish comes together with just a handful of simple ingredients, making this One Pot Coconut Chicken Curry a perfect weeknight dinner! 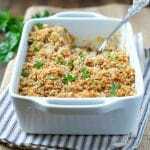 Serve it over rice for a healthy and satisfying meal that's full of fresh vegetables and lean protein. 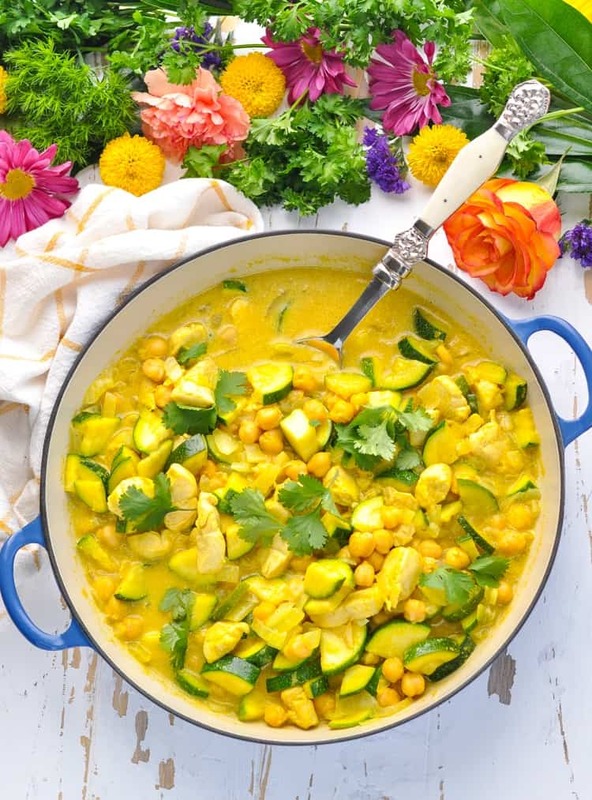 A vibrant, flavorful dish comes together with just a handful of simple ingredients, making this One Pot Coconut Chicken Curry a perfect weeknight dinner! 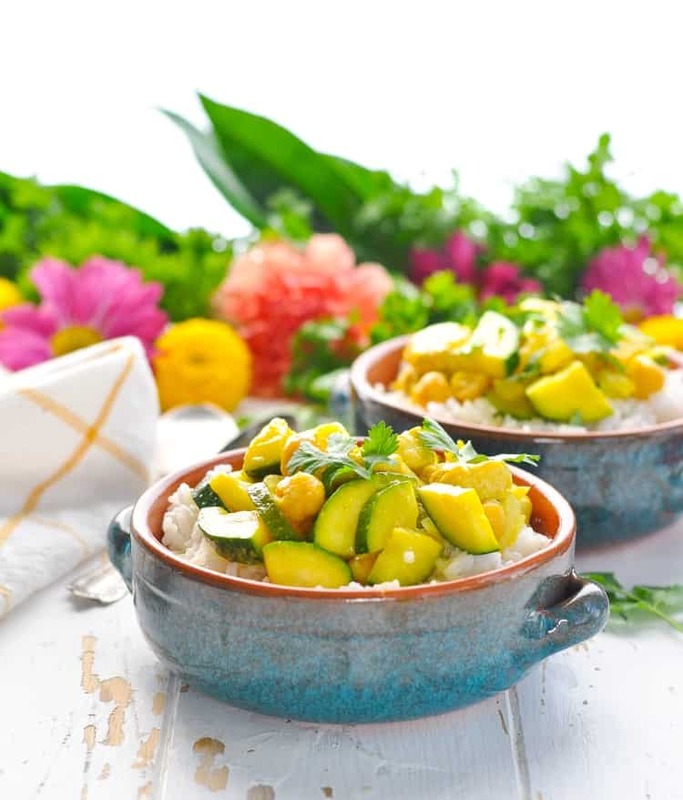 Serve it over rice for a healthy and satisfying meal that’s full of fresh vegetables and lean protein. 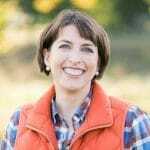 Sometimes I get hankering for a meal that tastes more exotic than the classic Southern home cooking that we find in our little rural Central Virginia town. Restaurants are scarce, so we’re normally forced to choose between fast food, Mexican, or pizza. Ya feel me?! Let’s just say that Thai, Indian, or sushi are NOT on the local menu. But that doesn’t mean that I have to go without! 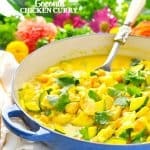 Thanks to this easy Coconut Chicken Curry, I can satisfy my cravings in the comfort of my own kitchen…with just a few simple ingredients. How do you make a Chicken Curry? 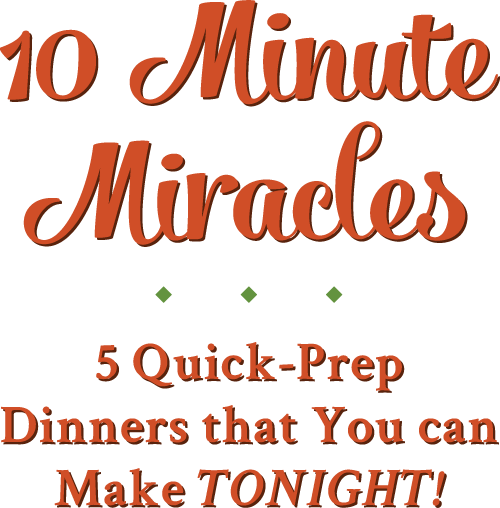 It’s always important to me that I’m sharing easy recipes that any new home cook can master. The process is simple, and the ingredients are easy to find in any little grocery store. Again, I don’t have access to fancy ethnic grocery stores, and even if I did, I wouldn’t want to spend a lot of money on spices or sauces that I might only use once or twice. I imagine that many of you are in the same boat! Instead, I’ve created an exotic-tasting one pot meal that’s accessible to ALL of us…no matter where we live. 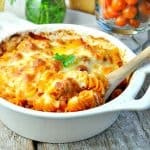 Best of all, this dish is healthy, light, and low in calories. It’s incredibly satisfying, thanks to plenty of fresh veggies, as well as filling protein in the beans and chicken. 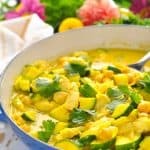 I serve it over rice for my carb-loving boys, but my Coconut Chicken Curry is also delicious over cauliflower rice for a lighter option. You choose! 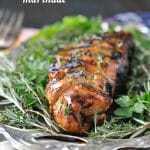 Heat olive oil in a large skillet or Dutch oven over medium-high heat. Add chicken to the skillet. Cook for 5 minutes, or just until browned on the outside. Don’t stir the chicken too frequently, since you want to give it time to sit in the skillet and get a nice brown exterior. The chicken doesn’t need to be cooked through at this point (since it will continue cooking with the rest of the ingredients), so you’re just looking for some color on the outside to add flavor. Add zucchini and onion to the skillet. Cook for 5 more minutes, stirring occasionally and scraping up the bits from the bottom of the pan. Add curry powder. Cook for 1 minute. Stir in chickpeas, reduce heat to low, and cook for 8-10 more minutes, or until vegetables are tender and chicken is cooked through. 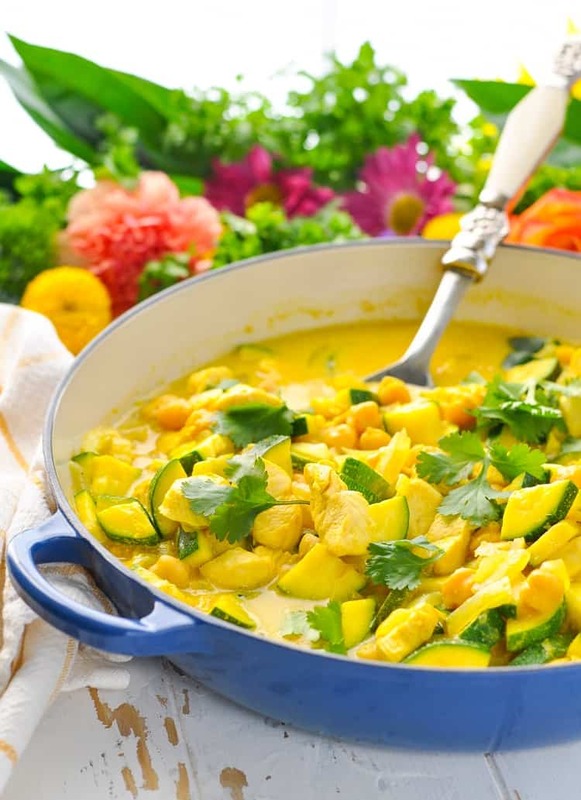 Serve curry over rice and garnish with fresh cilantro or parsley, if desired. Cooking Just for Two? 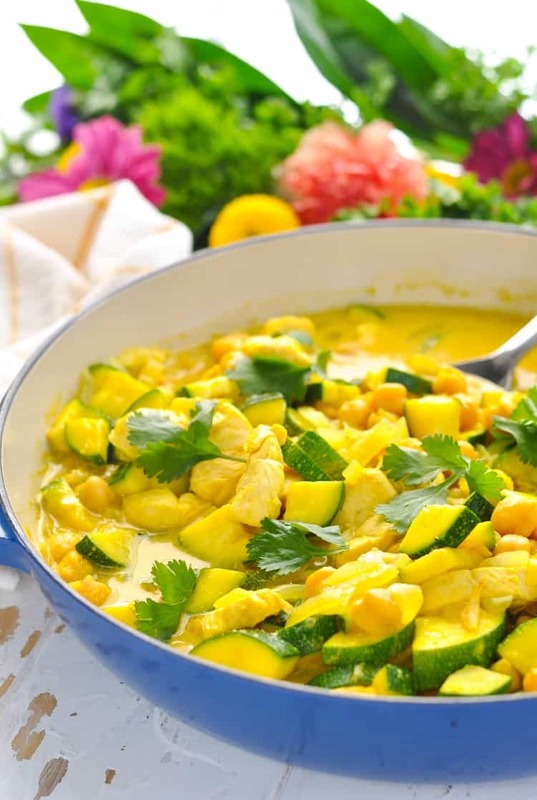 You can easily cut the ingredients in half and prepare the Chicken Curry in a smaller skillet. The cooking instructions remain the same. Want to Prep Ahead? 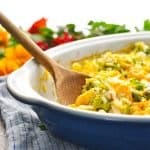 This is a great make-ahead option that you can prepare on the weekend (or early in the day) and then just reheat when you're ready to serve. Excellent, La Juana! It’s so perfect for those nights when you don’t want to heat up your kitchen with the oven or stand over a hot stove for too long! 🙂 Enjoy! to stressing over meals. I am not a good cook but your recipes has made cooking enjoyable for me, and it works, thank you. Hi, Janell! Thank you!!! Your kind comment totally made my day! 🙂 I hope that you enjoy the meal.